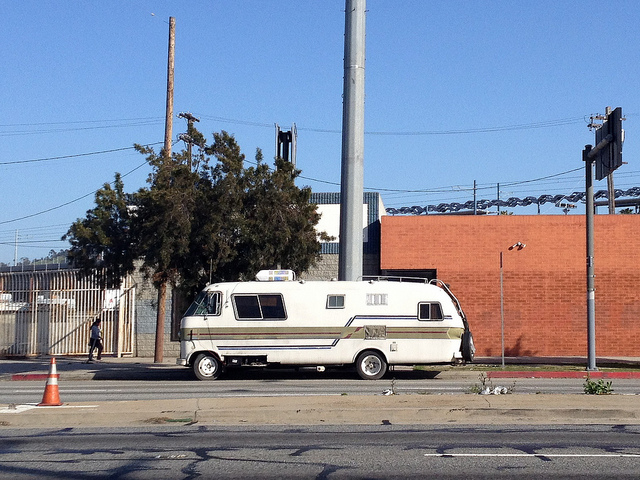 Vintage RV in Culver City. (Photo by Britta Gustafson via the LAist Featured Photos pool). Even though a federal judge previously ruled that it is illegal for the City of Los Angeles to outlaw folks from living in vehicles on public streets, the L.A. City Council is, once again, considering a new resolution that would... make it illegal for people to live in vehicles on public streets. As KTLA briefly reported on Wednesday, a public comment session exposed the city to criticism about it&apos;s movement to reword the part of the city code that governs whether or not a person can sleep in their vehicle. Back in 2014, a 9th Circuit judge ruled against the city, in Desertrain v. Los Angeles, saying that the city code&apos;s wording was &apos;unconstitutionally vague&apos; and promotes "arbitrary and discriminatory enforcement." Losing that case cost the city of Los Angeles $1.1 million, paid out in an August 2015 settlement with the law offices of Carol Sobel, a Santa Monica based attorney who specializes in homeless civil rights. Despite this, the L.A. City Council is considering a pair of amendments to that portion of the city code, each of which would reinstitute a ban on vehicular habitation if passed. You can read the proposed updates on starting on page 20 of Wednesday&apos;s meeting agenda [PDF Download]. One of the proposed amendments is a straightforward ban, declaring how "between the hours of 9:00 p.m. and 6:00 a.m., no person shall use a vehicle for lodging on any public street in the City of Los Angeles." The motion further defines lodging as a combination of either sleeping or meal preparation while "storing of contents inside a vehicle that are not associated with ordinary vehicle use" like sleeping bags, cookware or blankets. The alternative amendment includes the same language as above, but allows folks who display a &apos;vehicle lodging pass&apos; to park, and ostensibly live, on a city-designated, non-residential street. This pass will only be made available to those who request it after connecting with the city&apos;s homeless outreach services. A person without a pass, or indeed anyone at all under the first proposed amendment, would be subject to a $100 fine if caught sleeping in a vehicle. A second violation would be subject to a misdemeanor charge punishable by up to six months in the L.A. County jail, or a $1000 fine. Wednesday&apos;s public comment session began with a pair of questions from westside Councilmember Mike Bonin, the chief pusher of the newly proposed legislation. Bonin asked briefly whether or not commenters would support a city-sponsored living model that would allow people who live in vehicles to park designated lots, as they do in Santa Barbara. He then asked whether or not people thought it appropriate if, while the city is developing such a program, whether or not it is appropriate to limit vehicular habitation to certain streets, or if it&apos;s a right to park on any street. The public commenters launched, for the most part, broadly against the proposed motion, arguing that the scope of Los Angeles&apos; problem is orders of magnitude larger than Santa Barbara&apos;s, and that prohibiting people from living in their vehicles has already been ruled unconstitutional. Supporters of the motion argue that those living in vehicles are a public nuisance, and those who live inside them are prone to dumping trash or raw-sewage directly onto the street surrounding where the vehicle is parked. The proposed law will be considered by the entire city council in the coming weeks.